NFL – Domestic Violence – With the comment, “I didn’t get it right. Simply put, we have to do better. And we will,” NFL commissioner Roger Goddell acknowledged that the football league missed the call on domestic violence. Earlier this year, a video surfaced showing Baltimore Ravens running back Ray Rice involved in a domestic violence incident with his then girlfriend. After its own investigation into the incident, the NFL and Roger Goddell handed Rice a two game suspension as penalty. Rice later married his girlfriend and resolved his case by entering into a Domestic Violence Pretrial Diversion program. Under the program, he won’t be prosecuted, and the charges will be expunged after a year, the league said. 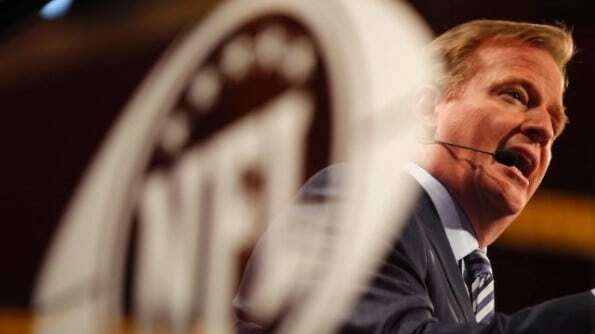 Under the new and improved sanctions by the league, the NFL has established a six-game unpaid ban for personnel who violate the league’s policy on domestic violence, Commissioner Roger Goodell said Thursday. A second incident would be punished by a lifetime ban from the league, Goodell said in a letter and memo to the owners of the league’s 32 teams. Lifetime bans may be appealed after a year. The policy, which is effective immediately, also applies to other types of violence. Goodell said the circumstances that would warrant a longer suspension include incidents that predate a person’s time with an NFL team or acts that involve choking, repeated blows or a weapon. They also include violence against a pregnant woman or in view of child. Goodell’s letter tells teams to distribute a memo about the new policy to each player and all members of the organizations. “Persons who fail to live up to this standard of conduct are guilty of conduct detrimental and subject to discipline, even where the conduct itself does not result in conviction of a crime,” the policy states. If you have questions about your Orlando domestic violence criminal charge and are interested in knowing your rights and possible defenses to domestic violence charges, contact the Winter Park, Florida criminal defense firm TILDEN LAW, rated A+ by the Better Business Bureau. Winter Park criminal defense Lawyer, Fleet Tilden, has 20 plus years experience successfully achieving criminal domestic violence charge dismissals in criminal cases in Orange County, Seminole County, Lake County, Volusia County, and Osceola County. We represent clients with Domestic violence in all Central Florida courts including: Orange County, Orlando, Seminole County, Altamonte Springs, Osceola County, Kissimmee St. Cloud, Volusia County, Daytona Beach, Deland and Lake County. Contact TILDEN LAW for a free and confidential case evaluation to determine your best defense, 407 599-1234.